Will Eno is a man of words. What else would you expect of a playwright? But more often than not the words spoken by his characters suggest the inner workings (or malfunctions) of their hearts and minds as they struggle to make sense of their own existence. In such works as “Thom Pain (based on nothing)” and “Title and Deed,” a single character delivers a monologue rather than engaging in conversation, unless, of course, you count the audience as the most important scene partner of all. But something quite different occurs in Eno’s play “The Realistic Joneses,” which opened on Broadway in 2014, and is now receiving its Chicago premiere in a skillfully realized joint production by Shattered Globe Theatre and Theater Wit. To be sure, Eno’s obsession with the uneasiness of being, and his attempt to capture that feeling in language, remains a driving force here, as does his suggestion that there is a great abyss between what a person feels and what he or she is able to express or act upon. Yet in this case, Eno imagines what happens when two couples of different ages – plagued by similar problems of communication and neurological degeneration – attempt to interact. And the result is in equal parts disorienting, frustrating, painful, blackly comic, and (to use a fancy mathematical term that perhaps most accurately describes the disconnect), “orthogonal” in nature. The couples meet rather awkwardly in what feels like a somewhat overly contrived setup on Eno’s part. But that initial awkwardness in some ways signals all that is to come. For as they engage in various awkward attempts at connection the four are continually plagued by static-filled disconnects in every aspect of their relationship to themselves and with each other. Luckily (or perhaps just conveniently), it is at this moment that their new, thirtysomething neighbors, John Jones (Joseph Wiens), and his pretty blonde wife, Pony (Cortney McKenna), make a somewhat clumsy entrance as they knock over the trash cans in the alley before introducing themselves and presenting Bob and Jennifer with a bottle of wine. As we discover, Bob is being treated for a serious degenerative illness that clearly has affected some (but not all) of his cognitive processes and causes clearly noticeable mood swings. At times he responds with exactly the right tart words and impatience, but he also can be overly blunt and utter quite inappropriate things. And while Jennifer tends to him with a great sense of purpose and devotion, she also chafes at his seeming refusal to respond to her, especially when she senses his response to Pony. John may be younger and more fit looking than Bob, but he, too, is plagued by troubling episodes that warp his vision and concentration. There is something unfocused (physical, emotional or both) about many aspects of his behavior, including what might or might not be his ability to hold a job. His wife, a greeting card designer, is needy, insecure and neurotic in her own way, and, like Jennifer, craves a fuller connection to her husband. So, the Joneses form a quartet of lonely but intertwined people, all of whom feel trapped as they desperately try to connect to themselves, their partners and their newfound neighbors. In a chance supermarket encounter, John and Jennifer try to unburden their souls. Something a bit more physical occurs between Bob and Pony in Pony’s kitchen. And the two men have a brief moment of bonding, too. All four of them just want to be heard, yet a certain deep loneliness, and a hovering sense of dread and mortality, are ever-present. Eno’s gift is his ability to find the heartbreak and fear, as well as the quirky comedy in all this. And it is not much of a leap to think of him as “the realistic Beckett,” with all the moments of repetition and tedium of that master also part of the mix. Director Jeremy Wechsler and his cast have tapped into the deftly conjured, fragmented, offbeat rhythms of Eno’s characters with impressive skill. Ward expertly captures Bob’s alternately impatient, sardonic, lost-and-found and depressed states of being, and Reiter perfectly suggests the impatience and exhaustion that come with being a harried caretaker. Wiens brings an ideally erratic quality to the nervous, on-and-off patterns of John’s responses to others. And McKenna captures the warring senses of self-doubt and hunger for accomplishment that bedevil Pony. 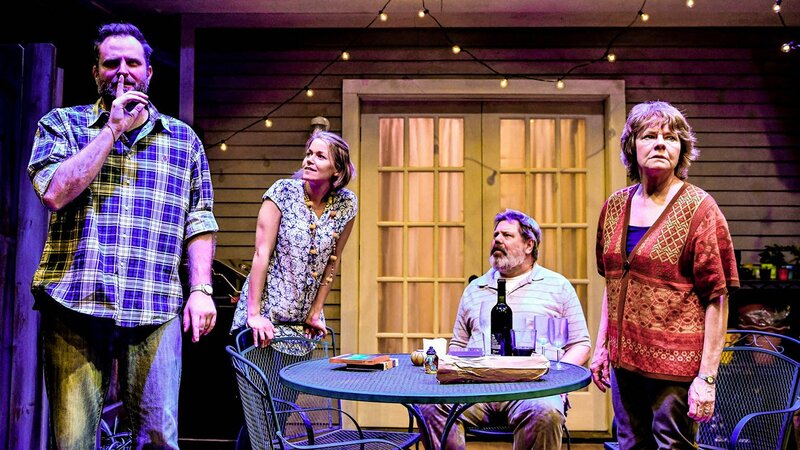 Jack Magaw’s set-on-wheels (with lighting by John Kelly) easily exposes parts of the homes of the two couples – the patio, a kitchen and a wall-like fence. And Christopher Kriz’s subtle sound design gives just enough of a suggestion of neurons that misfire in the brain and unsettle the heart. The Shattered Globe Theatre and Theater Wit production of “The Realistic Joneses” runs through March 9 at Theater Wit, 1229 W. Belmont Ave. For ticket ($24-$74) call (773) 975-8150 or visit www.shatteredglobe.org or www.theaterwit.org. Running time is one hour and 40 minutes with no intermission.